No matter what your level, beginning or expert, here's how to harness the power of nutrition to help reach peak performance in your martial art. 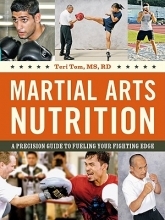 This title includes nutrition profiles, colour photos, and detailed training notes on Tom's high-profile fighter clients Amir Khan, Manny Pacquaio and Andrei Arlovski. The case studies offer examples of the book's methods and info in action, to help readers not just learn but use the nutrition approaches in the way best for them. Also featured are in-depth interviews with famed coach Freddie Roach and Sensei Peter Freedman. No stranger to the challenges of competition and the need to avoid 'hitting the wall', she guides you to choosing the best nutrition approach for you, from the several different training approaches this book offers.